In January 1965 a unique chapter of Australian military history was created when a young Royal Australian Engineers captain called Sandy MacGregor, encountering a Vietcong tunnel system, asked a very pertinent question – does anybody know w hat’s down there? 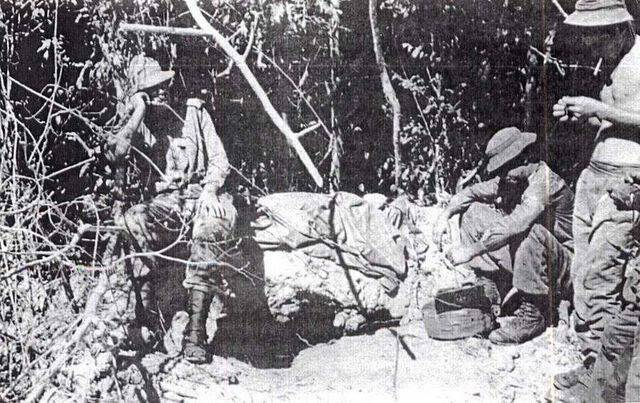 Sandy’s men in 3 Field Troop answered that by being the first Allied soldiers to explore the Vietcong’s tunnels in Cu Chi – US Army protocol was to identify the entrances and destroy them – thereby creating the legend of the Tunnel Rats. Fast-forward 46 years to the beginning of July 2011 when Allen & Unwin published 3 Field Troop’s story as Tunnel Rats, a real “Boys’ Own” adventure – only for grown-up boys – telling the story of the young Australian Army engineers who, when they weren’t having a whale of a time, often at their own officers’ expense, were the first Allied troops to go down the Vietcong tunnels and discovered their underground city. Tunnel Rats is a major rewrite of ‘No Need For Heroes’ the first-person memoir I wrote for Sandy about 15 years previously, but updated and re-tooled as a full-blown military history rather than a personal memoir. What I love about this story – and what made me want to go back and rework it after all that time – is that these guys were not only genuinely courageous and endlessly resourceful, they had a spirit of adventure and mischief that sustained them through what was a pretty horrific time. There are plenty of outrageous stories like the time they booby-trapped their own shower block – which they had built with money from their own little casino – rather than let it fall into the hands of recently arrived officers; then there was the ‘car chase’ through the streets of Saigon in which two sappers evaded the combined might of the US, Australian and South Vietnamese military police by commandeering a tuk-tuk and, ultimately, driving it under the barrier gate of their camp. There was the investigation of the Tunnels, of course and the discovery of the underground city – they were the first Allied troops to venture down there, regardless of who lays claim to that honour. And then there was the day-to-day engineering tasks that varied from building bridges to “de-lousing” booby-trapped rice caches, embodying their unofficial motto Facimus et Frangimus – ‘we make and we break’. 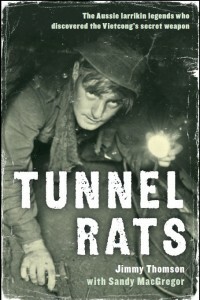 Tunnel Rats went into reprint in only its first week on sale and has done well since. You can listen to an interview with Sandy and me on Radio National, with Geraldine Doogue, HERE, read an extract (as a PDF) HERE, or buy the book, either as a paperback or an eBook HERE. 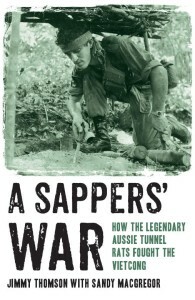 A Sappers War, published in 2012 and reprinted in pocket format in 2014, tells the story of the entire Sapper involvement in Vietnam, from before the Tunnel Rats’ arrival until the very last convoy out of the country in 1975. Have a look around this website and the books … this is a great slice of genuine Australian history featuring 67 forgotten heroes of the Vietnam War. By the way – this is not the official website of the Vietnam Tunnel Rats Association which is (www.tunnelrats.com.au). That excellent website is predominantly by and for Aussie Vietnam Veterans and has a stack of great information, stories and pictures. In fact, it’s worth a visit anyway … after you’ve had a look around here, of course. Tunnel Rats & A Sappers War Copyright © 2019.